Introducing Matcha Caramel-Apple; our "sweet tea latte". 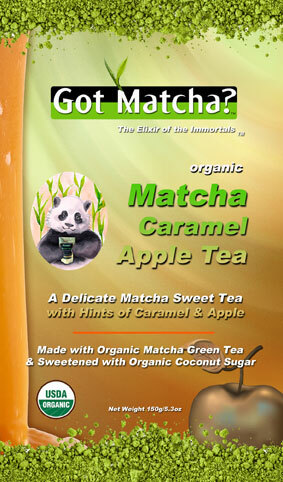 Got Matcha's Caramel Apple matcha latte is not only flavorful and soothing but rich in superfoods and healing properties. Picture smooth caramel smothered over a light crisp apple…now you know how this blend tastes. Through our combination of ingredients we have captured the rich caramel flavor with a subtle but fruity taste of apple. Let’s get to know a bit more about the stars of this blend…Matcha, apple and coconut palm sugar. You will be surprised to learn that Matcha and apple powder have many similar health-contributing properties. Apple powder (dried apple) contains pectin which is found in the apple skin and has many tested health benefits including gentle cleansing, natural weight management and much more. 1. Can help protect against inflammatory bowel disease including Crohn’s and IBS symptoms. 2. May help lower cardiovascular disease risk by helping to reduce cholesterol, specifically LDL levels. 4. Helps with weight management and natural weight loss. 5. When the pectin fiber binds with water in your colon it creates a gel-like substance that helps with constipation and cleansing. Matcha Green Tea is a superfood both nutritious and healing. 1. Increases thermogenesis in the body, becoming a potent appetite suppressant and increasing fat oxidation. This in turn helps the body to use fat as an energy source. 2. Japanese researchers have found that green tea consumption can lead to lower mortality rates in humans. 3. Protects against heart disease; among which would be: vasculoprotective, antioxidative, anti-inflammatory and cholesterol-lowering. 4. Recent evidence suggests that the benefits of matcha green tea can reduce the risk of Type 2 diabetes! Coconut Palm sugar has an exotic flavor profile with wonderful notes of light butterscotch and caramel and gives this Caramel apple the decadent caramel flavor. 1. Palm Sugar is naturally low on the Glycemic Index (GI), which is important to those who are concerned about weight control and diabetes. 2. While most sweeteners are devoid of any nutrients, coconut sap sugar is RICH in vitamins, minerals and amino acids. 3. Coconut sap sugar or palm sugar is now considered to be one of the best natural sweeteners, being touted as a "wonder sugar" because of its many health benefits. For more information on our Coconut Nectar sugar, please click here. 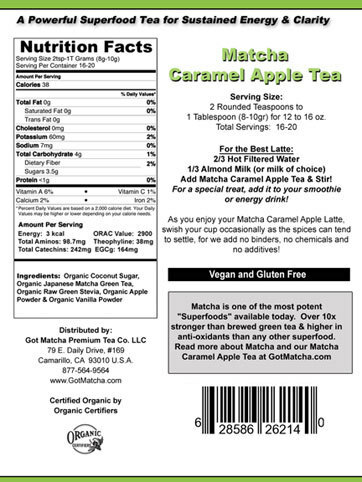 Clearly our Caramel Apple Matcha is not only appealing to the taste buds but is also appealing to the health of your entire body. While you sip on this latte you can feel good knowing this tasty treat is not only comforting but healing to your entire body. 2. We add 1 heaping tablespoon of the Matcha Caramel Apple and stir. That is all there is to it! Simple, quick and tasty. Where the Matcha can tend to clump a bit when mixing, with our Matcha Caramel Apple, the spices and the Coconut Sugar act as a perfect blending agent, so you have no problems with clumping...truly the perfect Green Tea latte!